Perhaps lighting a jar of “Poet’s Garret” will inspire your sonnet-writing. A whiff of “Spring Party” might just ramp up the festivities. “Scent grabs us in a way that no other sense can,” connecting to parts of the brain that process emotion and memory, says New York-based marketing strategist Alexander Jutkowitz. 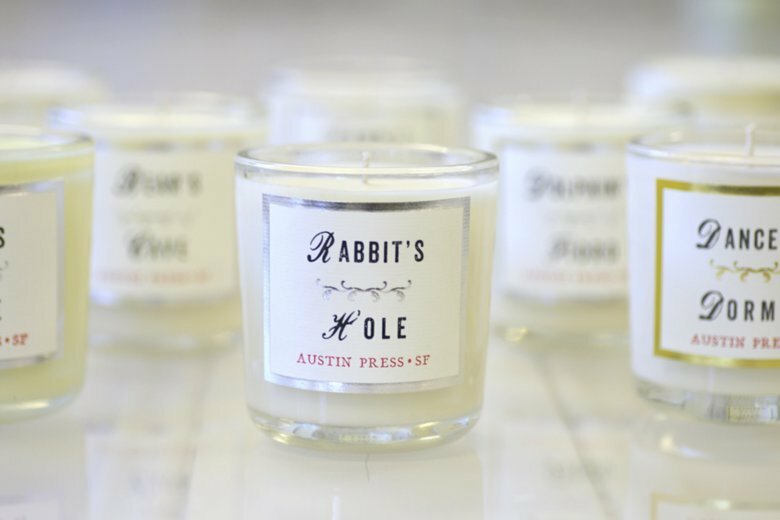 San Francisco letter-press designer Kimberly Austin has a line of jar candles, Sanctum for Austin Press . She’s given each concoction not only a cool name, but a little back story on the label. “Cowboy’s Camp,” for instance, is a mix of wood-smoke essence, tobacco, pine and horsehair. The story involves a cowboy setting up camp under the stars with his horse at his side. For “Dancer’s Dormer,” Austin sets the scene of a performer climbing the stairs to her attic apartment, walking on the ebony wood floor, and seeing a bouquet of geranium and juniper. Tangerine, vetiver and balsam characterize “Bear’s Cave,” with the story centering on a hibernating bear’s environment and the advent of spring. The collection, created by master perfumers and scent designers, includes evocative names like “Poetry” (vetiver, eucalyptus and guaiac, an oil from the South American palo santo tree), “Moondance” (bergamot, iris, amber) and “Kith & Kin” (orange zest, spice, soft wood). At Green Valley Aromatherapy in Courtenay, British Columbia, founder Barbara Greenwood offers essential oil mixtures like “Transitions,” with black pepper, rosemary, lemon and geranium. “Black pepper stimulates blood flow to help with lethargy and fatigue. Geranium is considered in aromatherapy to be a balancing oil and was added to help offer the warm hand of comfort. Lemon is a great oil to uplift and improve focus. Rosemary is considered to be a mental stimulant,” she says. Those seeking comfort might consider her “Solace,” a soothing blend of bergamot, marjoram and sandalwood. Or generate a festive air with “Spring Party,” a zingy mix of orange, peppermint and ylang ylang. At interior design firm Haus Interior , cotton wax candles include “Summer Haus,” a seasonally reminiscent blend of coconut and tonka bean, a legume with a vanilla-caramel taste and aroma. “Dock Haus” is a mixture of summer-cottagey birch and cypress essences, while “Winter Haus” combines warm fig with the smoky notes of a wood fire.